Wabma Kadarbu Mound Springs Conservation Park is best known for Blanche Cup and the Bubbler, the two mound springs with easy visitor access, parking facilities, interpretive information and boardwalks. 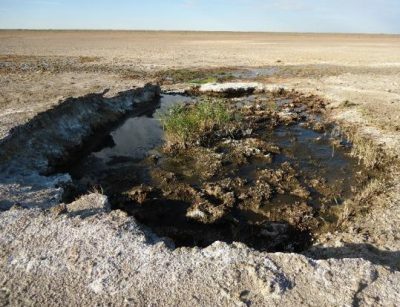 However, tucked away to the south and north of these springs is an extensive array of springs not readily accessible to the public. In the south of the park are Horse Springs and Buttercup Spring and FOMS inspected these springs during the June 2017 introductory trip described elsewhere in this newsletter. During this inspection, FOMS members were concerned to note cattle actively grazing on Buttercup Spring. 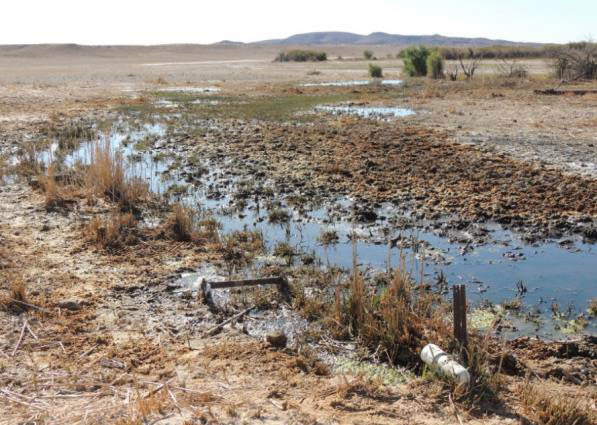 Likewise, at Horse Springs there has been substantial and recent cattle damage (see photo). It is clear that cattle have intruded into the Park from the adjoining Stuart Creek pastoral lease FOMS members noted similar damage during a visit in August 2016. Our most recent Newsletter, July 2008, carried a report detailing the on-ground conservation works carried out by FOMS members at the Peake in the course of our June 2008 field trip, and elsewhere in this Newsletter Simon Lewis has reported on the follow up trip of August 2008 to install State Heritage Branch interpretative signage at the site. 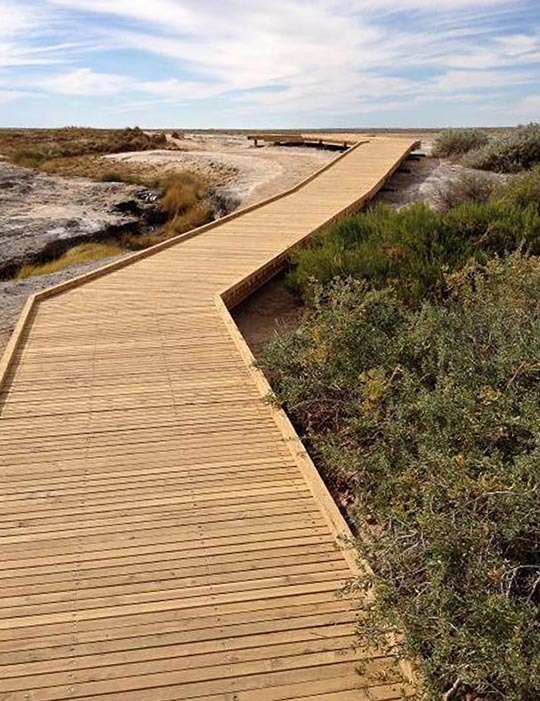 The third and final stage of the works will be carried out shortly with the installation of fencing adjacent to the final two kilometres of the Public Access Route (PAR) to the Peake heritage site. The fencing will prevent uncontrolled vehicle access and camping along the gidgee creek line immediately east of the site. It will also eliminate damaging vehicle access to the nearby cemetery. 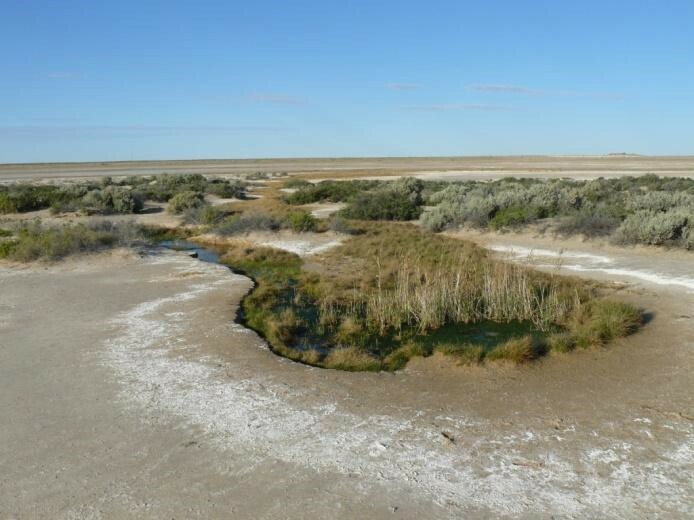 FOMS has initiated this final stage through the co-operation of two South Australian government agencies – the Department for Environment & Heritage and the Department of Water, Land and Biodiversity Conservation – and S Kidman & Co, the pastoral lessees of the Peake. The Government agencies have funded the materials for the fencing and Kidman & Co. will carry out the on-site installation. Up-dated signage provided by the Heritage Branch of DEH will also be installed. The three stage program of works was developed by FOMS in consultation with the relevant government agencies and Kidman & Co. following the FOMS field trip of 2007. 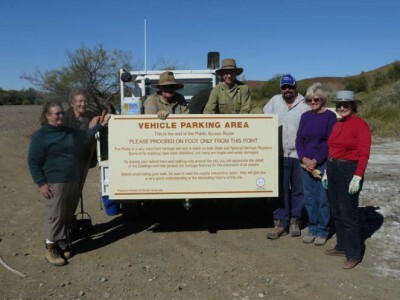 FOMS members on that trip were concerned at the increasing impact of largely uncontrolled visitation on the heritage site and adjacent Freeling Springs and in the wake of that visit FOMS took on a facilitating role to improve the situation, as well as providing voluntary labour for on-site works. Some visitors familiar with the Peake will regret that camping will no longer be available along the gidgee creek line, but at such a remote site the fencing is the only feasible management option. 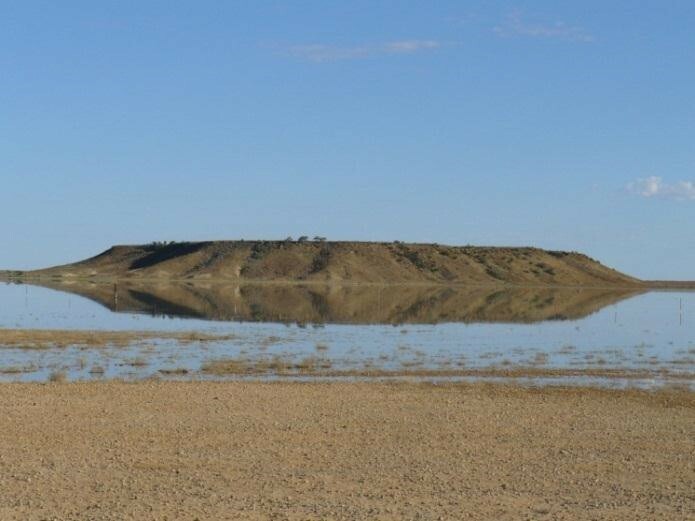 Alternative camp sites can be found on several drainage lines crossing the Peake PAR and good camping is also available adjacent to the Oodnadatta track near the Peake PAR turn-off. 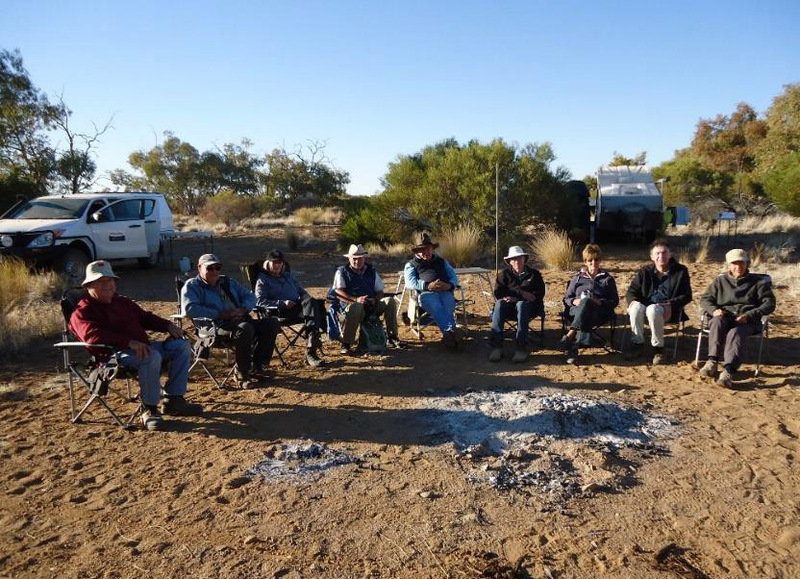 A 3pm rendezvous at Roxby Downs for John & Leigh Childs, Sue Black, Bruce & Sherrie Gotch, Ann Gorton, Colin Harris & Elaine Smyth, Dean Harris, Simon Lewis, Rick Moore, Anne Pye, and Doug Smith & Heather Woods. Unfortunately Travis Gotch was unable to join the group for a few days because of damage to his work vehicle. The remainder of the party headed up the Borefield Road to a very satisfactory camp-site on the Gregory Creek, near the sign to New Year Gift Bore 2. We were fortunate to be joined at the camp-site by Bobby Hunter, manager of Stuart Creek station. 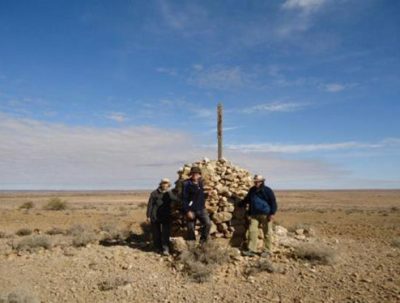 We met up with Justin Costelloe and colleagues from the University of Melbourne at the Borefield Road / Oodnadatta Track intersection. 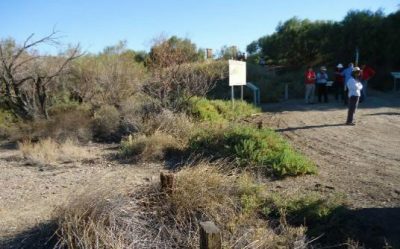 We also met with Reg Dodd (from the Arabunna community at Marree) who was accompanied by a group of Melbourne lawyers who are assisting the Arabunna people in their efforts to have heritage listing applied to Finniss Springs. Reg led the enlarged group in a guided tour of several points of interest on Finniss Springs. These included Finniss Spring ruins; several springs at Hermit Hill with their tall reed (Phragmites) communities; springs at West Finniss, where the group noted the very rare and isolated pipewort, Eriocaulon carsonii and attractive cutting grass Gahnia trifida (noteworthy as a disjunct species to that which occurs hundreds of kilometres to the south); and Bopeechee Spring, a spring that virtually ceased to flow as an apparent result of water extraction from Borefield A for the Olympic Dam mine, but which was “revived” through injection of bore water around the periphery of the spring to re-establish sufficient pressure to reinstate a flow. 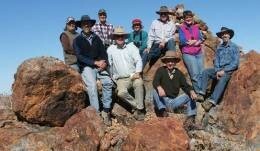 The FOMS group then headed north-west up the Oodnadatta Track. We had a brief stop at Curdimurka before venturing on to the Coward Springs Campground run by Greg Emmett and Prue Coulls where we camped for the next two nights. Some of the group inspected a few of the springs in the northern section of Wabma Kadarbu Mound Springs Conservation Park – specifically Elizabeth Springs and Jersey Spring. For some, the Elizabeth Springs were one of the highlights of the trip – the springs were in fine fettle and the weather was superb. Before lunch, most of the party then ventured out to Coward Spring. This is a spring where reeds (Phragmites) have steadily encroached down the tail of the spring, displacing the bore sedge Cyperus laevigatus, following fencing in the mid 1990s. After lunch, the group had a look at Blanche Cup and The Bubbler. At Blanche Cup we discussed the impact of visitors trampling C laevigatus around the open pool. A low board-walk or low protective fencing were two options suggested to deal with this. We then split into two parties. One group ventured to springs in the south of Wabma Kadarbu (Horse, Buttercup, and the Mt Hamilton ruins), while the other group drove into Emerald Spring. At Emerald, a search for a cone of stones, thought by Rick to be nearby, was not successful. Bobby Hunter also rejoined us and regaled the group with his memories of Coward Springs when it operated as a railway siding complete with pub. We proceeded to Strangways Springs with its ruins of the Overland Telegraph repeater station. 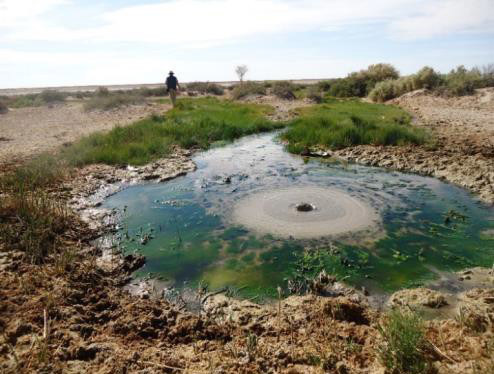 The group had a short ramble around the ruins and some of the ~450 springs at Strangways (of which, according to Travis, about 50% are active). Then on to William Creek for lunch, refuelling and a chance to check out the bar of the William Creek Hotel. After lunch we carried on up the Oodnadatta Track to Warrina Siding where Colin, under Elaine’s careful supervision, gave the Royal Geographical Society’s plaque a good going over. Doug finished the job with a rinse and a scrub with a washing-up brush. With the afternoon flying by, we decided on a quick trip into the ruins of the Old Peake repeater station. This proved to be a good decision as the ruins were splendid in the late afternoon sun. 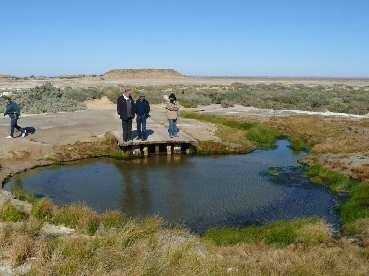 Bruce then led us to a magnificent spring nearby – clearly the pick of the Freeling Springs. A wonderful sight with a large expanse of open water with some black swans in residence. We then returned to our pre-selected campsite on the Old Peake Public Access Route. Another fine day as we proceeded to the new Peake homestead where we caught up with Adam, the acting manager for Kidmans. 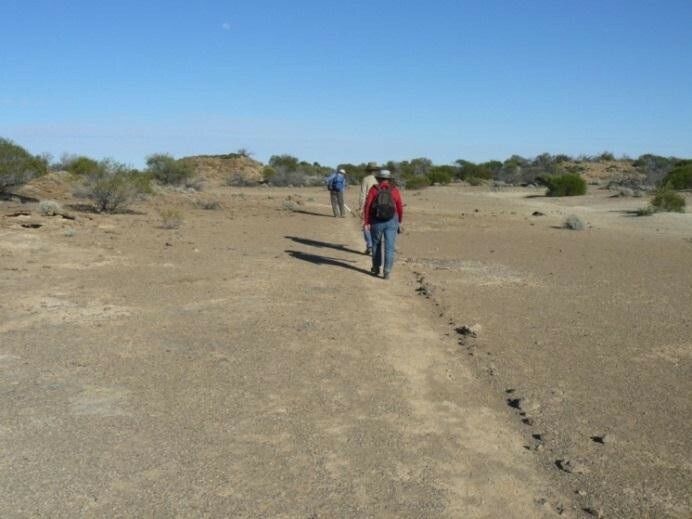 Then down the station track to Milne Spring – with its bore, natural spring and impressive rock formations – and on to Levi Springs where the adjacent rock formations contain Aboriginal circular etchings or petroglyphs. After Levi we drove on to Spring Hill, where Rick led us to one of Stuart’s cones of stones at the top of the Hill – an impressive sight. The convoy then journeyed onto Tarlton Springs, where we also met up with Travis as well as Bruce and Sherrie (who had kindly taken Ann Gorton down to William Creek that morning). Tarlton confirmed our concerns from previous inspections – the Typha springs were essentially ex-springs with the Typha (bullrushes) dead and just a little of the sedge Cyperus gymnocaulos hanging on. We were interested to note, however, an active spring in the bed of Hope Creek outside of the fenced area (possibly Stuart’s “Spring of Hope”). That evening we camped at a very good site on Bulldog Creek. Adam of the Peake Station joined the group at Outside Spring and we spent the first part of the day looking at springs nearby which had been fenced off in the 1980s. Kelli-Jo Kovac and Reece Pedler from BHP Billiton also joined us for the day. The four springs were Outside Spring showing extensive growth of Phragmites within the fenced area with little change since last inspection (2005), although the adjoining unfenced spring has an increased proportion of Typha; Twelve Mile Spring with extensive Phragmites with some Typha at top vent and a recently established area (~2 square metres) of Typha on edge of Phragmites near the top of Vent #3 (Phragmites has spread considerably at the top of the mound since the last inspection. 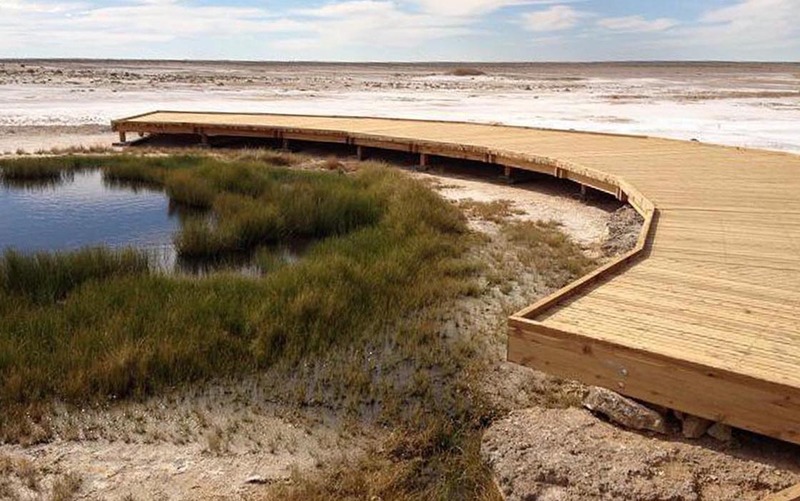 ); The Fountain which is a Phragmites dominated spring with little apparent change since the last inspection; and Big Perry where the Phragmites and Typha exhibited little change. With light rain developing, we drove on to George’s Creek for lunch and combined this with a walk over to the Old Umbum Station ruins. Then on to Louden Spring, once one of Stuart’s favoured camp-sites, now extinct. The group arrived at the campsite on the Douglas River in plenty of time to prepare for a camp oven extravaganza prepared by Travis, with pre-dinner nibbles laid on by Kelli-Jo courtesy of BHP. With final farewells, the group dispersed, some heading for home and others continuing to enjoy the region for another day or two. The week had been a resounding success: good company, great weather and plenty of interesting locations.